Jose Berrios struck out 10 batters on opening day and Jake Odorizzi made it 11 on Saturday, so what can we expect from Michael Pineda on Sunday? At the very least, we likely can expect another close game, if there’s a game at all (more on that in a moment). But first, Saturday’s game. Odorizzi struck out 11 over six innings, while the Cleveland Indians’ Trevor Bauer made nine batters whiff over seven innings. So it was a classic pitchers’ duel. Both teams scored a run in the fourth inning and rode that all the way to the top of the ninth inning when Twins reliever, Blake Parker, surrendered a run and the game to the Tribe. -Opening day attracted a sellout crowd of about 39,500; Saturday’s game did not. About 15,000 showed up for Game 2 of the 2019 season. Although it was sunny, it also was 34 degrees, making it the third-coldest first pitch at Target Field. And now there’s some doubt about whether Sunday’s game will be played. My son and I are back in Minnesota to see the Twins, and wouldn’t you know it? As soon as we check into our hotel and flip on the TV, one of the local stations, WCCO, reports that there’s a chance of rain or snow in Sunday’s forecast. However, that is not what the weather app on my phone is forecasting and neither is The Weather Channel. Keeping my fingers crossed. -After I learned that Surly Brewing was within walking distance of our hotel, and also kid friendly, we made the short trek and quickly discovered what must be the most popular brewpub in the Twins Cities. It was packed! Faced with a table wait time of more than one hour, we threw in the towel, returned to the hotel and had a disappointing meal via Uber eats. We will save Surly for another, hopefully, slower night. -On the way there, I took a picture of some old grain elevators — not the first time I’ve seen that type of structure in this part of the world. 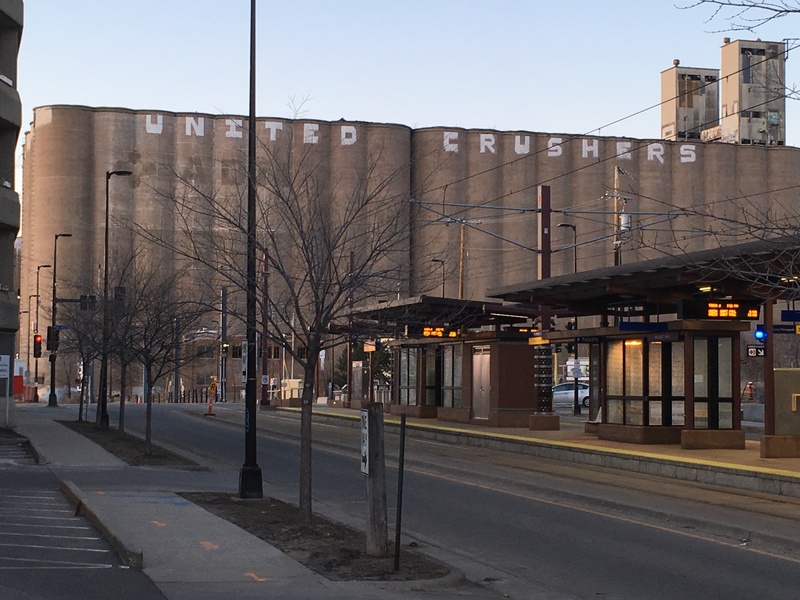 At first glance, I thought the former operator was known as United Crushers. That’s not the case at all, according to MinnPost.